Tuesday night's Meet-the-Brewer at the Green Dragon was extra-special. 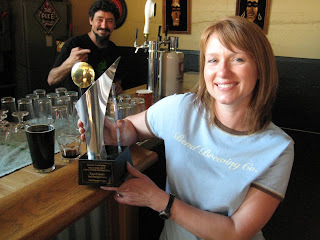 The meetee was Bend Brewing's Tonya Cornett, who won the Champion Brewmaster award in the "small brewpub" category at the 2008 World Beer Cup. She brought along her trophy and some excellent beers: Hop Head IIPA, Axe Head Red Ale, Paulina Pale Ale, and Blackjack bourbon-aged Porter. The Hop Head was the clear winner with our crowd -- a thick, hazy, hoppy treat. The Red Ale was very good, less dangerous to drink than the big IIPA. Speaking of dangerous, that's a good description for the strong, dark Porter, which was tasty but very bourbony, so watch out if you don't like that. It's not just Tonya's recent award that made the session special; it's the fact that you can rarely find any of her beers in Portland. And that's not likely to change: there are no plans to start distributing them. She said that occasionally someone from the Green Dragon or Bailey's will be passing through Bend and stop in to buy a keg. But that's it. A few years ago Dave and I stopped in to Acme at SE 8th and Main Street (it's since been aptly renamed "Plan B"). They had a couple of beer taps named after the bar, I don't exactly remember the names, something like Acme Amber and Acme Pale. We knew they weren't brewing there, so we asked what the beer was. It was like "Who's on first?" because neither Dave nor I had heard of Bend Brewing at that point. "You make your own beer?" I'm pretty sure Plan B doesn't still serve them, and given Tonya's comments on distribution, it looks like Bend Brewing ales will be a rare treat for us around here. Take advantage of them when you see them. For further reading on the Champion Brewmaster award, here's an Oregonian article that came out shortly after she received it. Bil? Bil with one 'l'? Is this you? We're all diffr, Po. But anyone can see that I have two Ls.